Deutscher Soldatenfreidhof Vladslo. The Cemetery is about a mile and half north east of Vladslo which sounds like it should be on the steppe somewhere but isn’t, it’s in Western Flanders towards Diksmuide, Belgium, itself about 20 miles North of Ypres. Somewhat hidden amongst woodland, very much off the beaten track, we drove in a circle trying to find it. Initially the cemetery was established during the Great War, with 3,233 wartime burials from this predominantly Belgian stretch of Front. In 1956, it began being used as a concentration cemetery for other smaller Burial grounds in the Diksmuide area. Now it contains the remains of a horrifying number of boys and men, over 25,000 in total. The German system and style are culturally and aesthetically different, Langemarck and Vladslo are both beautiful in their own way, I think they’re altogether more haunting than the CWGC style. There’s something so bleakly Teutonic about the space and feel, the colour and even the Typeface (an early German grotesque forerunner of Helvetica) it all differs but it tells a familiar story, the sma ebook bound in a different cover. Beneath the trees in the broken sunlight in the silence it almost feels for an instant as if you are underwater. These are concentration cemeteries, we have done something similar but not on this scale, all of the German dead in the smaller battlefield burial grounds were moved to a number of these across the Western Front. Each grave marker bears the name, rank, and date of death for up to 20 soldiers, it is a field of individual nightmares, terminated stories from young men little different from the men they were fighting. Usually you will find a mass grave with familiar squat sculptures, names remembered on wooden or granite plinths and in a register, grass and stones, to describe it as such does the space a disservice. There are various different sides to the arguments as to why these concentration cemeteries exist, I’ve read that the French and Belgians started moving the bodies in a state of post-war enmity towards their foe, Henry Williamson was highly verbally critical of it in letters which ran against the grain in Britain after the war. I’ve also been told that it is in fact an old Germanic procedure; the brothers in arms lying together much as we their cousins do. 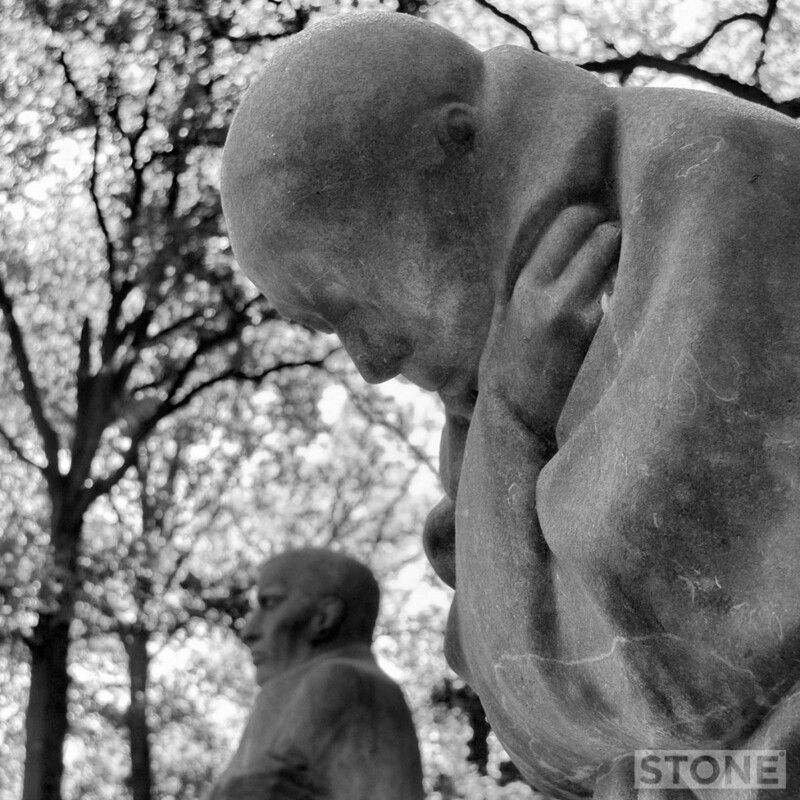 The main focus of this place for me is the sculpture at the rear, created by Käthe Kollwitz, die Eltern, or The Parents also commonly called The Grieving Parents look out over the graves. Administered by the Volksbund Deutsche Kriegsgräberfürsorge cemetery in Belgium this is the third largest of six. Kollewitz’s Mother has her head bowed, her hand to her breast were she once held her child, the father gazes forward through blank hooded eyes, his shoulders hunched and arms crossed across his chest in silent pain. In front of them stretch the rows of black granite blocks and the fallen. Kollwitz was heavily involved in The Modernist art movement and with it its politics, she made a stand alongside many others including Mann against the Nazis, her work was rejected as ‘degenerate’ or ‘the best sort’ as I like to think of it, she was ousted from the Preußische Akademie der Künste, and even threatened with concentration camp internment if she did not comply. She didn’t. She proved to bit too famous to vanish. The truly extraordinary thing about this carved block of stone is the line of the body of the mother. Follow it, she is facing the grave of Peter Kollewitz her son. Peter died on the 23rd October 1914 during an assault at Dixmude, his youthful idealism snuffed out, he had been at the front for two days. He is nine markers away directly in front of her. Kollwitz had struggled with her loss and feelings of betrayal and guilt for years, the sculpture was maybe her answer, and formed for her in part an apology from one generation to another, so she poured her feelings into this piece, basically a self portrait. 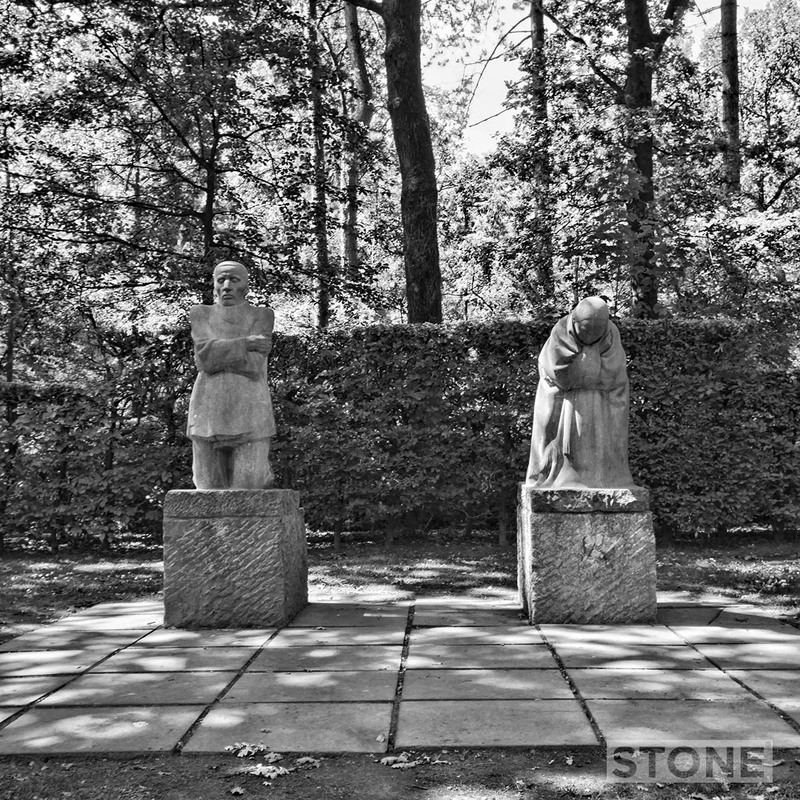 Originally the sculptures were erected at Eesen Roggeveld where Peter lay for over 40 years. Sadly her pain did not stop here, her husband died in 1942 and her grandson died on the Eastern Front in 1944. Like so many people her life was partly defined by her family’s experiences in both wars. If you put aside the red brick might of Thiepval, or the solemnity of Menin, or even the sheer beauty and scale of Vimy, Vladslo expresses a somehow deeper connection between one mother and her young dead son than any other place I’ve ever visited. It is the square root of an emotion a distillation at the hands of one woman of the pain and anger and sadness of grief. You can feel it flowing through the stone. Vladslo is without doubt one of the bleakest and yet most moving places I’ve been to on the front. Yet she never did give in, despite the shape of her work covering everything from grief and pain to poverty, her anti-war stance and her idealism went with her until the end. Move him into the sun: Gently its touch awoke him once, At home, whispering of fields unsown. Always it woke him, even in France, Until this morning and this snow. If anything might rouse him now The kind old sun will know. Think how it wakes the seeds: Woke, once, the clays of a cold star. Are limbs, so dear-achieved, are sides, Full-nerved, still warm, too hard to stir? Was it for this the clay grew tall? O what made fatuous sunbeams toil To break earth’s sleep at all? I agree with you Nick, its a very moving place and sums up the sheer futility of war. “He is nine markers away directly in front of her” – a sadly literal depiction of how death distances us from our loved ones, even after an outpouring of love, effort and pain into the sculpture commemorating her son. As for finding the courage to let children go to war, I don’t even know if I’d apply that word to myself if I were ever to find myself in that situation. Resigned terror would be more like it. I don’t imagine they had the sense of choice we have now. Conscientious objection would be less of a social stigma in 2015, I suspect. Lovely, bleak and wondering writing, Nick.